This edition of a timeless classic--enhanced by Emergent leader Tony Jones--will appeal to college students, readers new to Christian classics, and anyone else who desires to learn how to make spirituality a moment-by-moment way of life. 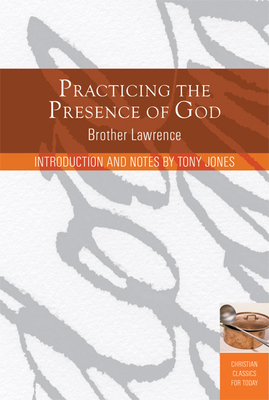 Brother Lawrence's Practice of the Presence of God has stood the test of time because it chronicles the life of a very ordinary person who became an extraordinary Christian. Through a life of humility and service, Brother Lawrence achieved something that many Christians aspire to: he was so concentrated on God that God became a part of his every breath. Whether deep in prayer or peeling potatos in the kitchen, he knew God's presence. This readable translation, replete with enlightening background notes, will appeal to today's reader in ways that no other edition has been able to do. Sallie Culbreth is the founder of Committed to Freedom Ministries (www.committedtofreedom.org), a Christian recovery resource for survivors of childhood abuse. Sallie's ministry and writing come from her personal experience of childhood sexual abuse and recovery. She holds a bachelor's degree in pastoral ministries and a master's degree in counseling studies.